Inkymole: Mail Me Art 2013 - Short and Sweet! Every year for the past few years Darren di Lieto, who runs the massively popular Little Chimp Society illustration blog, has put together a labour of love he calls Mail Me Art. The idea is brilliantly simple: ask 200 of your favourite illustrators to create artwork on a C5 envelope and post it back to you. Any theme, any subject, any media - the only stipulation being that the art is what it is, without folding or other attachments, and whatever state it arrives in when Darren receives it, that's how it will go into the show! First coming to our attention a couple of years ago when he was doing a book signing at the big Borders in Leicester, we popped in to see him and ended up chatting online a bit later. We kept in touch, and in the meantime, our gallery space was built here at 71. It was therefore natural that when it came to thinking about a new space in the Midlands for the Mail Me show, whose traditional home is in London, Darren being a local lad thought of our gallery. 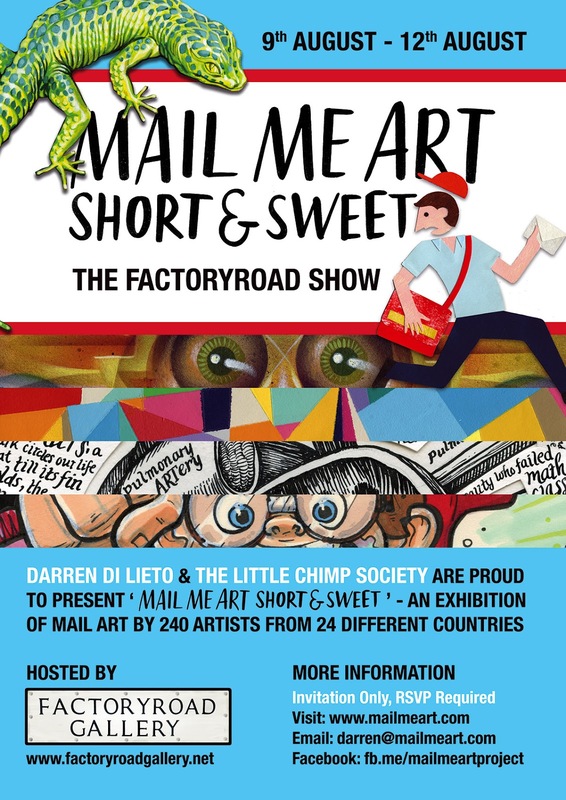 And thus, we are proud to announce that Mail Me Art 'Short and Sweet' will be opening here on August 9th at 6.30pm. This year the show includes work by ex-Inkymole assistant Brook Valentine, eyes-and-ears collaborator Bob Neely and Inkymole's writing department Ed Garland, alongside more established illustration stalwarts like witchcraft-in-metal Melanie Tomlinson, Jon Burgerman, Linzie Hunter and The Boy Fitzhammond. And me (there's a modest slice of mine on the flyer, a black ink eye-strainer). Oh - and 192 more of course!